NEW DELHI, India (CNN) -- The only surviving suspect in last month's attacks in Mumbai has written a letter to the Pakistan High Commission, or embassy, seeking legal aid, CNN's sister network in India reported Saturday, quoting a Mumbai police official. Flames and smoke gush from the Taj Mahal hotel in Mumbai, India, on November 27. Investigators said that Mohammad Ajmal Kasab is from Faridkot village in the Okara district of Pakistan's Punjab province and that the other nine attackers also are from Pakistan. Pakistani officials have denied that assertion, blaming instead "stateless actors." Rakesh Maria, Mumbai's joint police commissioner of crime, said Saturday that Kasab's three-page letter was written in Urdu. In the letter, Kasab confesses his role in the attacks, CNN-IBN said. The letter is to be delivered to the commission's New Delhi, India, office, possibly Monday, the network reported. Maria paraphrased parts of the letter at a news conference but did not release a copy to the media, CNN-IBN said. More than 160 people were killed in the three-day Mumbai siege that started November 26 and targeted 10 sites, including two luxury hotels, a train station and other landmarks. Of the 10 suspects, only 21-year-old Kasab survived, according to police. This week, Pakistani authorities banned a charity linked to the attacks and placed its leader under house arrest, Pakistan's information minister told CNN. The move came after the U.N. Security Council designated the charity, Jamaat-ud-Dawa, as a terrorist organization because of its links to Lashkar-e-Tayyiba (known by the acronym LeT) and placed sanctions on the group. 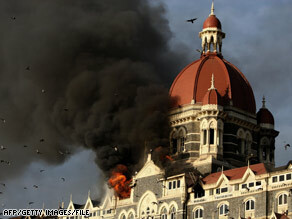 India has blamed LeT for training the attackers who carried out the Mumbai attacks.